Simplistic design with anything but basic performance, the Dean SR42G Super Runner gas fryer’s features offers any commercial kitchen capability and control. Dip one of its dual fry baskets into a massive oil contact surface thanks to Dean’s exclusive Thermo-Tube Design heating tubes with flow tube baffles and bring new meaning to the term fast food with controlled heat of to up to 43 lbs. of oil. 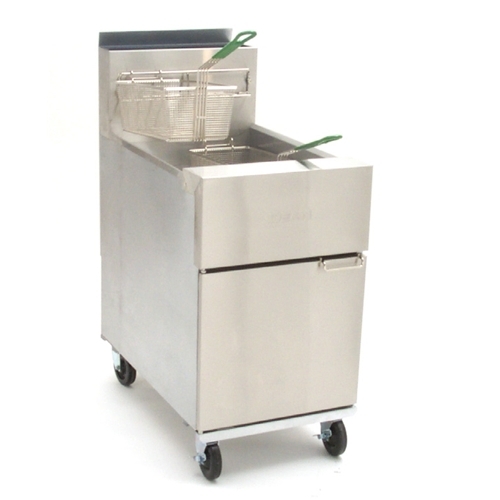 A fry cook’s delight, the Dean SR42G boasts a 14” x 14” frying area with automatic thermostat providing prompt recovery reducing time between loads. Carbonized food particles? We’ll have none of that! As Dean’s wide cold zone avoids wasteful oil deterioration by trapping debris.